Established in Bienne, Switzerland in 1914, Glycine has maintained through the years a select line of timepieces, based on the strong foundations of the brand and reflecting their times.Glycine Incursore Stainless Steel Mens Automatic Swiss watch Model# 3874.999-LB / 3874-999-LB. The watch case is crafted from Sandblasted PVD coated stainless steel 316L and is presented on the black genuine leather strap with white stitching, Black dial set with black hand indicators, Arabic Numeral & index hour markers, Date display at the 4 o'clock position, Scratch Resistant Sapphire Crystal, Swiss Automatic self-winding movement, ETA 2824-2, Caliber: GL 224, 25 Jewels, 11 1/2'' lines, 38 Hour Power Reserve, Hz: 4/28'800 vibrations per hour, Ruthenium coated oscillating weight on ball bearing decorated special Glycine engraving, Water resistant to 200 meters/660 feet. 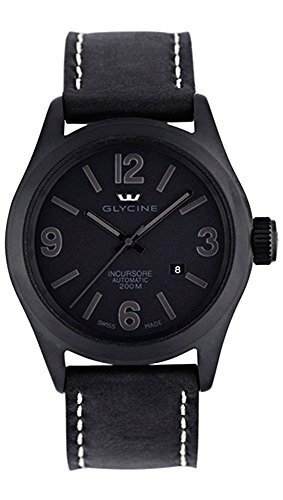 Two Year Limited Warranty.As all of our watches, this Glycine Incursore Gents watch is BRAND NEW, and comes in its original packaging with the warranty card and papers!